Treemaps offer a simple way to visualize datas because it used only two parameters as ‘name’ and ’size’ of a ressource ; into a delimited space each rectangle is drawned according to its weight. 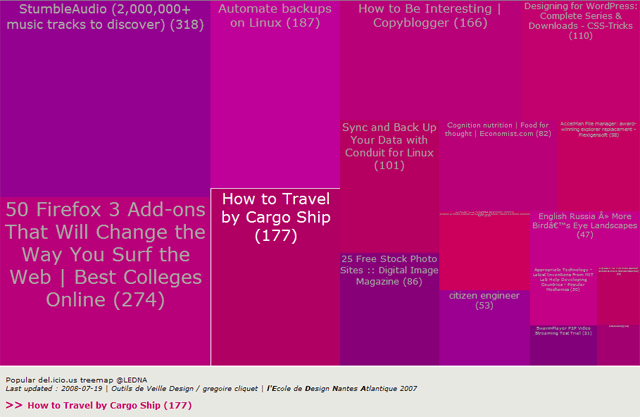 Based on Squarified Treemaps (Mark Bruls, Kees Huizing, and Jarke J. vanWijk), del.icio.us popular treemap grabs once a day most popular bookmarks from http://del.icio.us/popular/ and display them as an interactive (clickable) treemap. 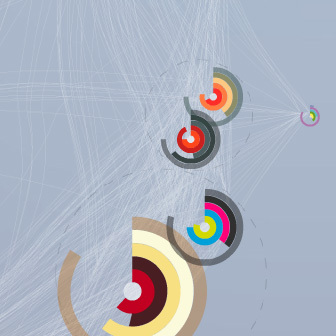 infoviz is a research department of l'Ecole de design Nantes Atlantique directed by Gregoire Cliquet. - Original Theme (minim) by Robert Ellis. - Flash based Tag Cloud for WordPress By Roy Tanck.